Examination Schedule of End Semester Examination has been announced for the SOP, SA , SCADMS, SET and SBS&R- 2018-19. The results have been declared for MBBS 2nd Professional Regular and Nursing Supplementary April 2019. Honble Vice-Chancellor of Sharda University has appointed Prof. R. K. Saket, FIE (India), SMIEEE(USA), MIET(UK), Department of Electrical Engineering, INDIAN INSTITUTE OF TECHNOLOGY (Banaras Hindu University) Varanasi (UP) – 221005, as an examiner to conduct PhD Viva-Voce examination of Ms. A. Ambikapathy (working under the supervision of Prof. Gajendra Singh) for the award of Ph.D. degree in Electrical and Electronics Engineering. Notification no. 463: Payment of Tuition Fee and Hostel Fee 2019-20, by the continuing students. School of Dental Sciences, Sharda University is organizing a 4th International Dental Student Congress on 12th-14th April 2019. Schedule for OnDemand Examination Schedule 2018-19(Odd semester) has been announced for SET, SBS, SOL, SOE, SBS&R, SCADMS, SHSS and SAP. Honble Vice-Chancellor of Sharda University has appointed Dr. Shashank Bishnoi, Associate Professor, Department of Civil Engineering, Indian Institute of Technology Delhi, Hauz Khas, Delhi as an examiner to conduct PhD Viva-Voce examination of Mr. Sunil Kumar Saxena (working under the supervision of Prof. N. B. Singh, Department of Chemistry, Sharda University) for the award of Ph.D. degree in Chemistry. School of Basic Sciences and Research, Sharda University in association with Indian Association of Nuclear Chemists and Allied Scientists (IANCAS), BARC, Mumbai is organizing DAE BRNS-IANCAS National Workshop “Radiochemistry and Applications of Radioisotopes” on February 04-08, 2019. Click here to view the more details. School of Business Studies and T&P Department of Sharda University is organizing a half-day HR Seminar on November 24, 2018, in association with Human Resource Federation of India (HRFI).The purpose of this HR Seminar is to provide a platform for interaction among HR leaders from industry, faculty, and students, and also, to explore & enhance the placement opportunity for our students. School of Nursing Sciences And Research has been announced the result for for B.Sc.Nursing - I II and III- Supplementary-October'2018. 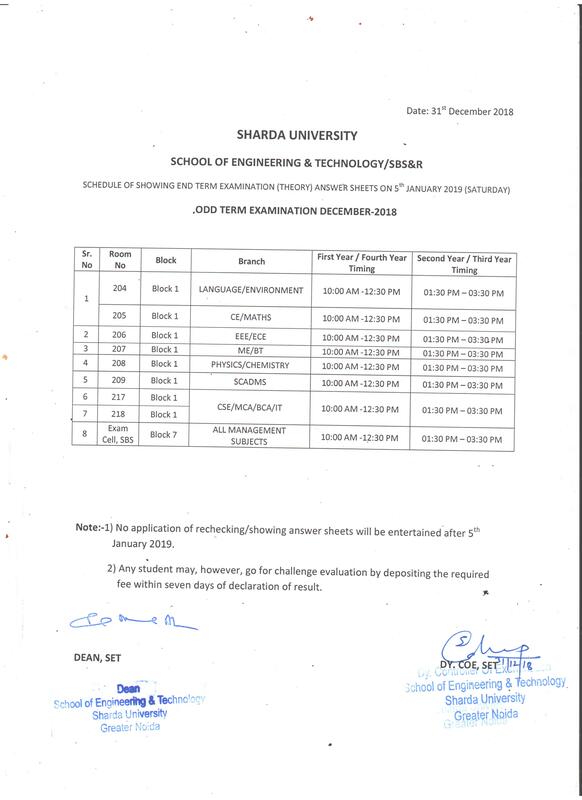 School of Education, Sharda University has been announced for Back Log Exam Notification 2018-19. Sharda LaunchPad (SLP), and the Timeliners (TVF) are organizing a launch event for SLP and Start-Up Session with a view to focus celebration of women in technology and entrepreneurship. The event will have a special screening of the popular web show Engineering Girls followed by a panel discussion and Q and A on Entrepreneurship. The panel would comprise of select few women entrepreneurs from diverse backgrounds who will share their college, professional and entrepreneurial life with the audience. - Mr. Sumeet Rana, Assistant Registrar, Sharda University. He can be reached at #+91-7895004303. School of Medical Sciences and Research is organizing an ‘Orientation Programme for the new entrants of MBBS. IUDI DNCR in collaboration with Sharda University is organizing a Two-day workshop on “Faculty Training on Urban Design”. We are pleased to announce the launch of our new age programme by the Department of Genetic Science & Engineering. Genetic Science and Engineering is a department with academic excellence which imparts quality teaching, high-end research and technology development in frontier areas of Genetic Engineering, Stem Cell Biology, Oncology, Biomedical Engineering and Molecular Medicine. School of Dental Sciences is organizing an ‘Orientation Programme for BDS new entrants of 13th Batch 2018.